Note: Before loading things onto the shelf, please turn it tight and repeat again after one hour for insurance. Dimensions: 13.5" x 5.7" ,suction cup diameter 2.6"
1. Super strong suction power, large space for store, bearing up to 13.2 lb weight for 1-2 years. 2. The hook can spin 360 degree freely, worry free about the position. 3. Endure at least 5 years. 4. Made of SUS304 stainless steel.Super strong model for storage. 5. DIY concept. No tools required, no drilling holes onto the wall, easy to install and detach with just bare hands. 6. Compatible for use at bathroom, kitchen, washroom, lavatory, etc. 7. IMPORTANT:The suction of this bathroom shelf works best on ceramic tile,glass,mirror acrylic, laminate and any non-porous surface with glossy finish. will NOT work on surfaces of ceramic tile that are porous, bumpy or matte finished. For daily maintenance,pls clean the shelf with soft Cloth(not included). 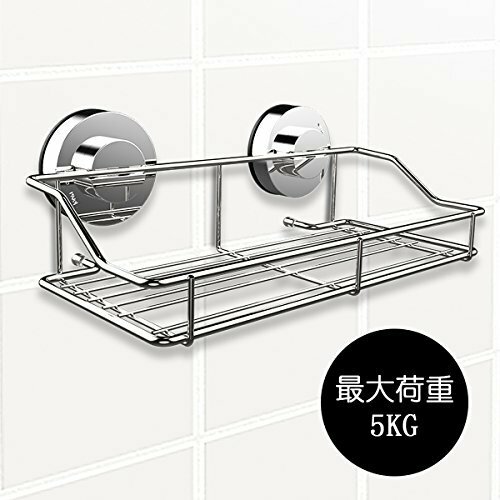 View More In Shower Caddies. If you have any questions about this product by Fypo, contact us by completing and submitting the form below. If you are looking for a specif part number, please include it with your message.